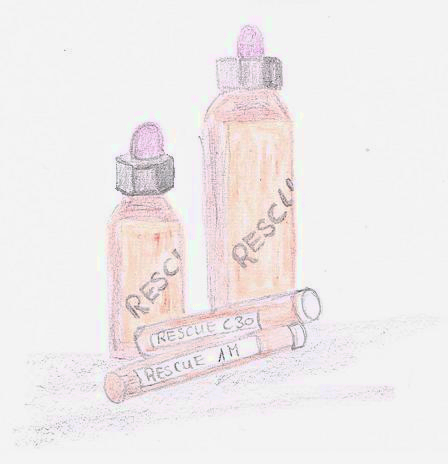 Bach, Hahnemann and the Rescue remedy | Clever H. - the Mag! The most widely known, and therefore probably the most famous remedy of the Bach flower essences is undoubtedly the Rescue-remedy. Not a remedy of single constituent; it is in fact a complex preparation of 5 different flower remedies, namely Impatiens, Star of Bethlehem, Cherry Plum, Rock Rose, and Clematis. This complex was combined to provide an emergency formula that could provide relief in moments where an individualized appraisal of a case is not possible. Bach developed it to enable immediate treatment in cases of crisis, trauma and stress . * Impatients – Impatience, Frustration & Agitation . Nervousness, tension, tantrums . * Star of Bethlehem – Shock . Trauma, Post traumatic stress , . * Cherry Plum – Fear . Suicidal thoughts. The terror is their own . Fear loosing control , . * Rock Rose – Panic, terror , . Anticipated fear . * Clematis – Detachment from reality, loss of focus, confusion, withdrawal. – Impatients – relaxes, and calms agitated states . Alleviates impatience and lowers stress . – Star of Bethlehem – Revitalizes, fosters inner strength . Helps to recover and deal with trauma and shock . – Cherry Plum – reconnects with the self (higher), strenghthens spiritual understanding . – Rock Rose – quenches fear, calms . Mobilizes forces within, allows growth . – Clematis – brings clarity, grounds . – Adrenal rush and burnout with anticipatory anxiety, palpitation, restlessness. – Helpers syndrome/wounded healer. Emotional compromise. – Feeling under pressure. Need for release of internal pressure. Suppressed emotions. – Recurrence of trauma / injury. Bach, in a talk in 1931 praised Hahnemann as a great master, for the light that he shed onto the nature of disease, and for evening out the path to true healing . He further stressed that it was thanks to Paracelsus’ and Hahnemanns’ teaching that awareness arose, and that disease details should not be given too much importance. Rather should the personality, the person within, be treated, knowing that disease would subside when the spiritual and mental being were in harmony . Bach applied the hahnemannian method of potentization to the production of his bowel – nosodes, rendering toxic substances into potent medicines. Edward Bach even became praised as ‘the second Hahnemann’ . It is therefore quite interestingly recommendable to view the Bach-flower therapy in the light of homeopathy, in order to understand it better [3, p.30]. Edward Bach was born in 1886, he studied medicine, became a physician, pathologist and bacteriologist. His scientific research made him investigate pathogens and lead him to produce vaccines aimed at rendering potentially ill-making diseases harmless . His interest diverted to the bowel bacteria of which he found in tests, that in chronic disease certain intestinal bacteria were in numbers elevanted. He began experimenting with the creation of vaccines from these bowel bacteria . The ‘heroic’ medicine of the time saw practitioners handling crude substances, such as arsenic, mercury and other poisons in the treatment of patients. Bach, like Hahnemann 100 years prior, recognized that such material health care had no potential to heal. He began seeking a more holistic approach . He, like previously Hahnemann was convinced that not the disease, but the individual should be treated, and that mental / emotional factors could not be excluded and viewed as irrelevant in the treatment of patients, . Bach too like Hahnemann, believed in an interaction of chronic disease and the elimination of toxins into the bowels. Bach viewed the toxic waste of certain bowel bacteria as identical to what Hahnemann described as ‘Psora’. Bach began creating potentised remedies from his bowel vaccines and prescribed these not routinely, but only as and when needed by an individual patient . He continued his bacteriological studies and investigated how the bowel bacteria digested sugar and reacted in the process. As such he was able to identify 7 bacteria groups. These groups became the starting material of his homeopathic nosodes with which he began treating patients . His treatment successes showed that not only did the patients intestinal flora alter, but also specific local symptoms were improved. This important finding supported the hahnemannian claim that not the individual illness should be treated but the underlying cause . Bach sensed that there might be 7 fundamental personality types that could match the 7 bacteria groups he had identified and assumed that changes in the bowel flora could develop changes in the emotive soul states of patients . He further came to believe that the processes of digestion, in fact all internal processes of the body, must have a signature in nature. He had noticed parallels to the evolvement of flowers, and sensed a connectedness . His search for such gentler remedies lead him to identify 38 fundamental states of negativity of the human mind, and he found 38 flowers that met these emotional states . The Bach flower essences that we know today, are of the 38 flowers he identified. Bach died in 1936 . The full proving of Rescue as a homeopathic remedy is available at  below. Scheffer, M. & Storl, W. (1991) Neue Einsichten in die Bach-blüten-therapie. 3.Auflage. München: Wilhelm Heyne Verlag. Teleosis (2014) HomeoRescue: The homeopathic proving of Bach Rescue remedy [online] available at: http://www.homeocollaborative.org/THC%20Website%20pdfs/HomeoRescue%20Proving%20Details.pdf. Bach, Edward (1990) Die heilende Natur. München: Wilhelm Heyne Verlag.